Hanna Michel "Jean" Khoury passed away on May 22, 2017, but his words, actions, and ideals will long outlive him. his Emory appointment as professor. In his 13 years at Emory, he also served as executive associate dean of research and chair of the Department of Hematology and Medical Oncology at Emory University School of Medicine. He is editor-in-chief of Cancer. This is an edited version of a tribute published in the journal Cancer online ahead of print June 16, 2017. Hanna Jean Khoury was a man full of passion, full of life, resplendent with the courage to take life on in all of its complexity. He was the physician's physician, the mentor's mentor, a wonderful father and husband, a man in full in the best sense of the phrase, and an incredibly close friend. He was a man with infinite grace, never seeming to break a sweat even while seeing over 50 patients a day, but he did not glide through life. He was smart, thoughtful, kind, athletic, patient, analytic, loving, precise, and possessed of a remarkable judgment, especially on people. I first met Hanna in December of 2003 when he served on the faculty at Washington University in St. Louis. Winship hematologist Ned Waller came back from a visit to St. Louis bubbling with energy after meeting Hanna and absolutely convinced we had our future chief of Hematology. Hanna had everything: a track record of exceptional clinical interventions, publications at a young age, impeccable clinical skills, an incredibly humble and sincere approach, and the ability to look you in the eye and speak with such quiet certitude that I knew I was in the presence of a wonderful human being who was a natural leader. Hanna would grow to become a pioneer in molecular targeting of leukemias and he led and completely revitalized Winship's Division of Hematology and Leukemia Program. 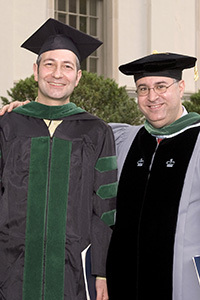 His extraordinary skill and compassion as a physician and clinical investigator led to many accolades and awards, including being named the inaugural holder of the R. Randall Rollins Chair in Oncology in the Emory School of Medicine, and election to the Alpha Omega Alpha medical honor society. He served with great distinction in major international leadership roles at the American Society of Bone Marrow Transplantation and the American Society of Hematology. Hanna loved people but he lived to push them out of their comfort zone. An incredible athlete, mentally and physically, he would disrupt to a certain degree and then come to my office to ask if he was causing too much trouble. But he always went back for more. He was an equal opportunity mentor to nurses, staff, medical students, residents, fellows, junior faculty, senior faculty, and especially to me, his always beleaguered department chair. I would think he was coming by to ask for help in solving his challenges, when in fact he was coming to solve my challenges. When I accepted the job as president of the American University of Beirut, Hanna was among the very first to know. This was not only because he was and always will be one of my closest friends, but I knew the anxiety it would provoke in him. He looked at me and said without hesitation, "This time you are actually going to take the job." Hanna had grown up under the shelling of the Lebanese Civil War and spent days on end in a bomb shelter. In Atlanta, he found a delicate but durable slice of peace, prosperity, and creativity for himself and his family. 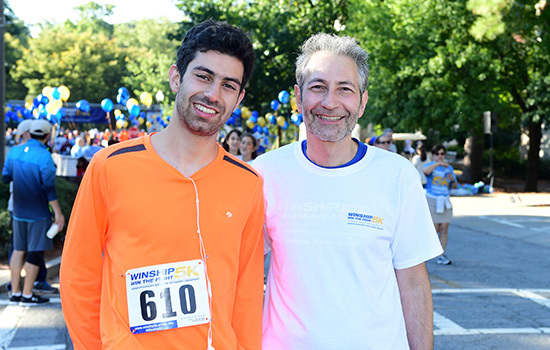 His wife, Angela, and three children, Mikhail, Iman and Alya, always came first in his life, but he was also incredibly proud of and attached to our Winship family of physicians, scientists, nurses, trainees, staff, and especially patients. I reassured him that it was not his time to return to Lebanon: "One day," I said "but not now. You are doing too much good." Hanna came to my inauguration in Beirut. Less than six weeks later, I got a message that filled me with dread. Always poised and polite, my friend asked me to call him as soon as possible. I called him and he told me he had esophageal cancer. For more than a year, Hanna fought back with everything he had. The man given to provoking the very best in others bore his own challenges with a smile and set about to console others with his grace and humor. He was the shining example of a man who was, in the immortal words of Lincoln, one of those rare "better angels of our nature." I will remember him always smiling, prodding and enabling people to tap their potential. Celebrate the beauty of life, he said so often, and leave a real piece of yourself behind. He definitely did. He really was a master physician, a matchless friend. Contributions to a fellowship program in honor of H. Jean Khoury can be sent to Winship Cancer Institute, Office of Gift Records, Emory University, 1762 Clifton Rd., NE, Suite 1400, Atlanta, GA 30322.